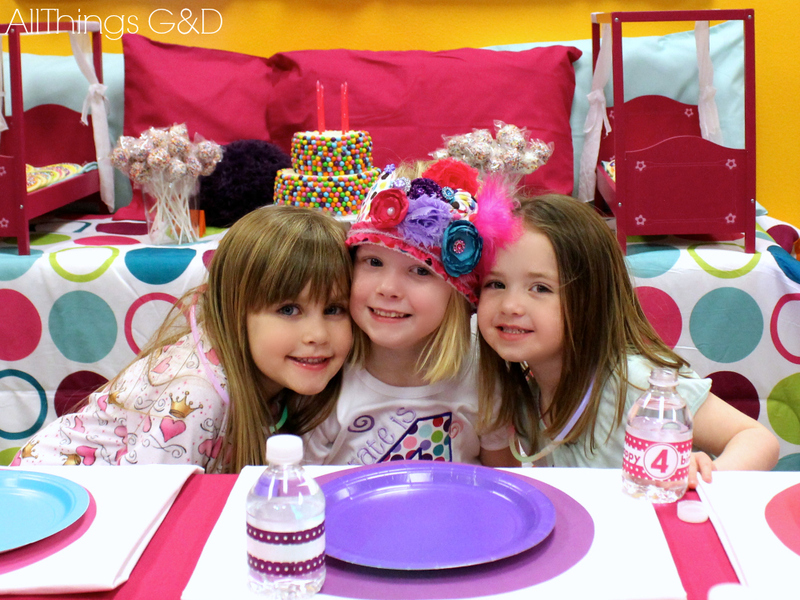 Kate and I had so much fun planning her 4th birthday party! 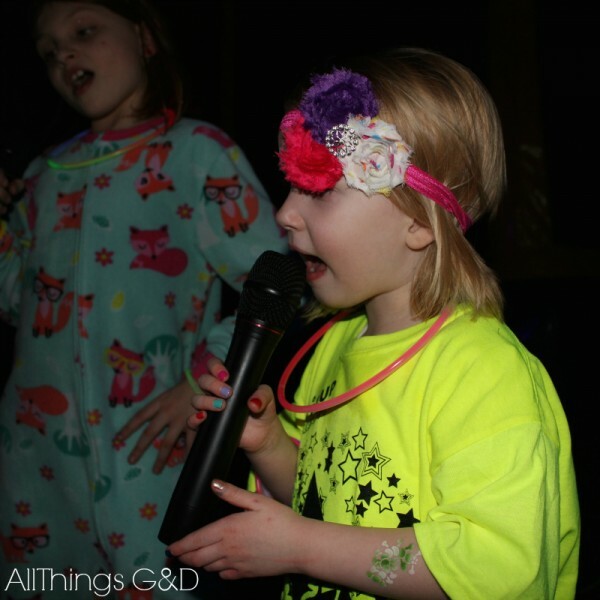 This was the first year that she had some definite opinions on how she wanted to celebrate her birthday and I loved party planning with her! 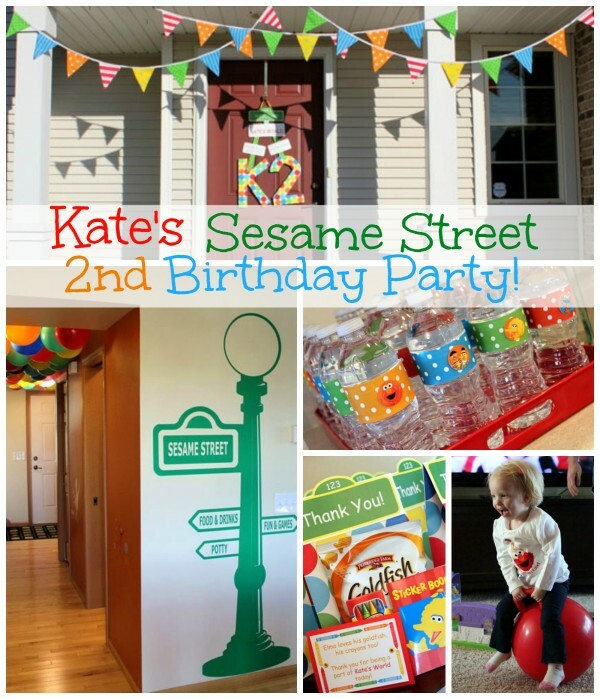 G and I wanted Kate to choose her own birthday party location this year. 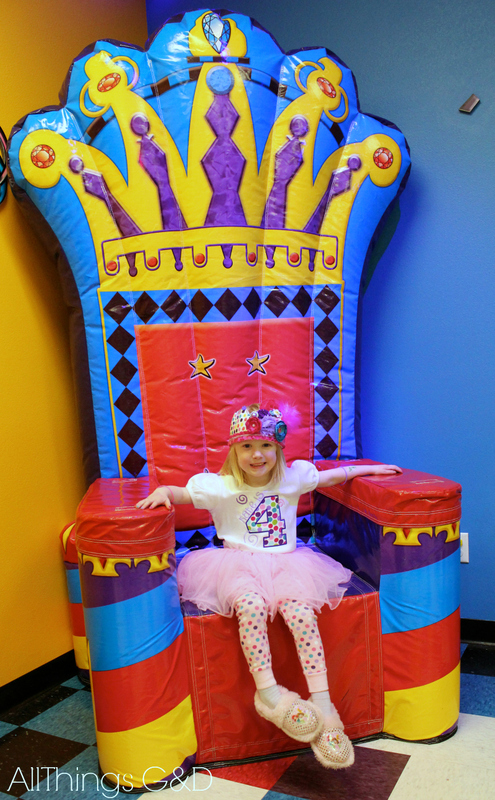 We gave her a few options of some of her favorite play places and she chose Pump It Up – an indoor party place featuring gigantic, fun-filled inflatables, including bouncy houses, slides, and obstacle courses. 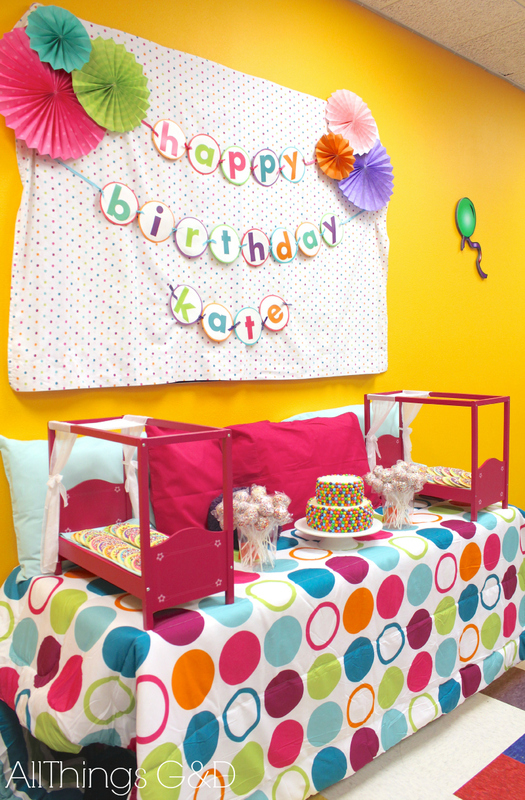 Kate loves going there for their open playtime, but as we soon found out, their party packages are phenomenal! Once our location was set, it was time to choose a theme. One of Kate’s many loves is pajamas. She’d happily wear them all day long if we let her (sometimes we do) and “pajama day” at school may as well be a national holiday in her book. When I rattled off a variety of theme ideas for this year’s celebration she jumped at the idea of making it a pajama party. 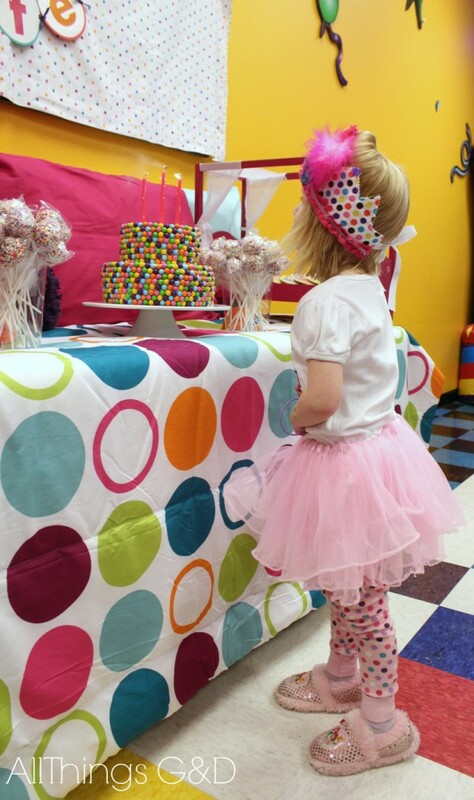 A few days later she informed me she wanted polka dots (one of her other loves) for her party, too. 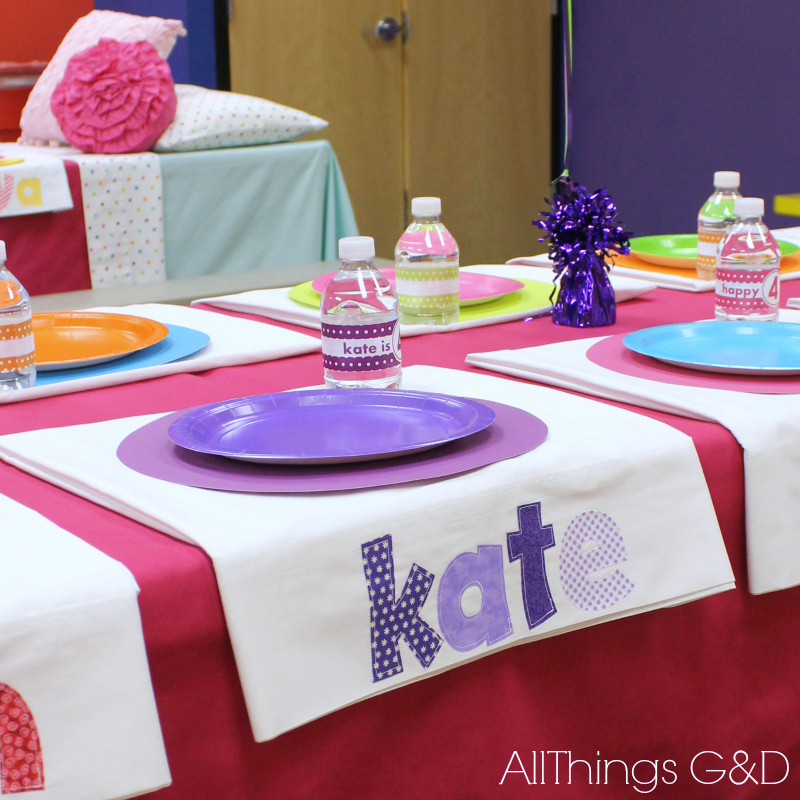 I loved Kate’s “Polka Dot Pajama Party” theme, and my wheels were quickly spinning with ideas! I wanted the details to be a surprise for Kate, but along the way she chimed in with additional thoughts that I was happy to make happen, including polka dot balloons and a cake instead of cupcakes. One of my favorite ideas from Kate was when she asked for a birthday crown. 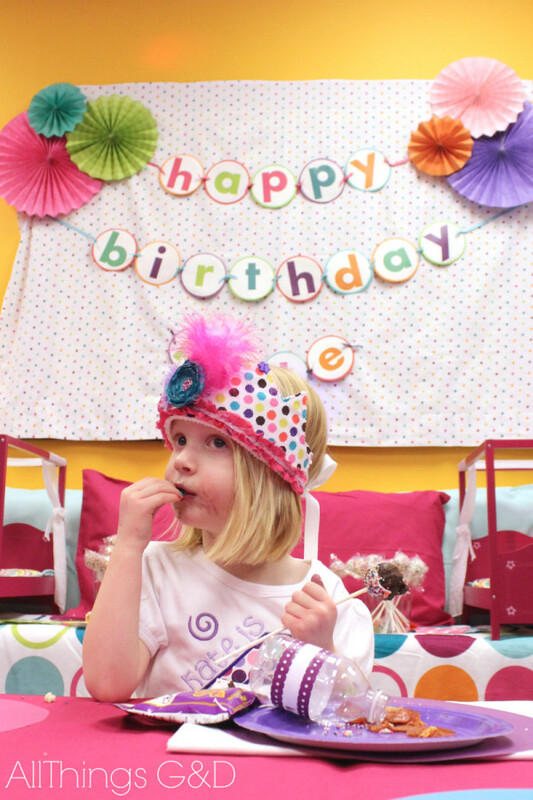 (“Not a tiara – a crown.”) She sat on my lap as we browsed Etsy, and much to my amusement she chose the biggest, most decorated crown I could find (plus a headband to wear as an accessory during jumping when I told her her crown wouldn’t stay on). With my almost-4-year-old’s loves, ideas, and opinions in mind, it was time to make it all happen! The party room at Pump It Up, transformed into Kate’s Polka Dot Pajama Party! Any guesses on the birthday girl’s favorite color? Kate’s polka dot birthday cake. 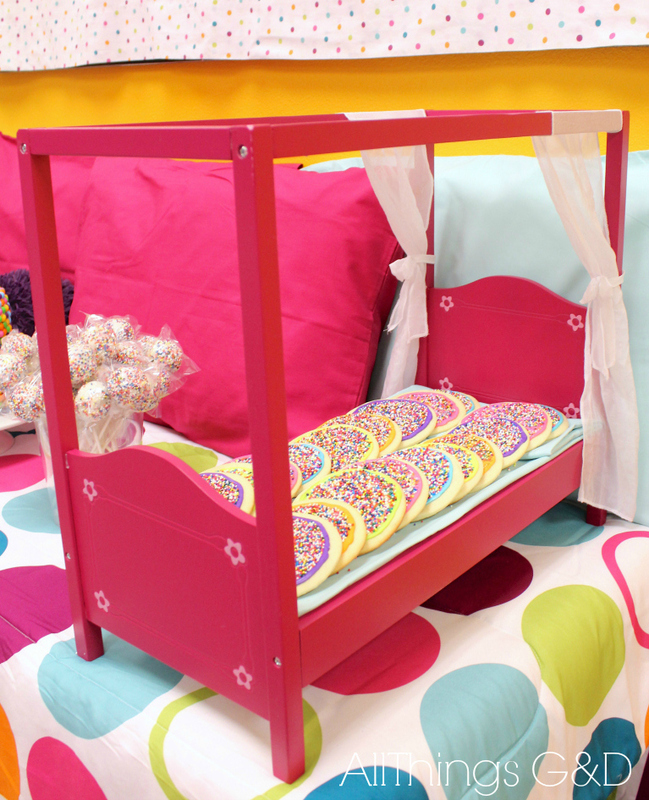 Matching doll beds added to the pajama party theme and made the perfect resting spot for polka dot cookies! 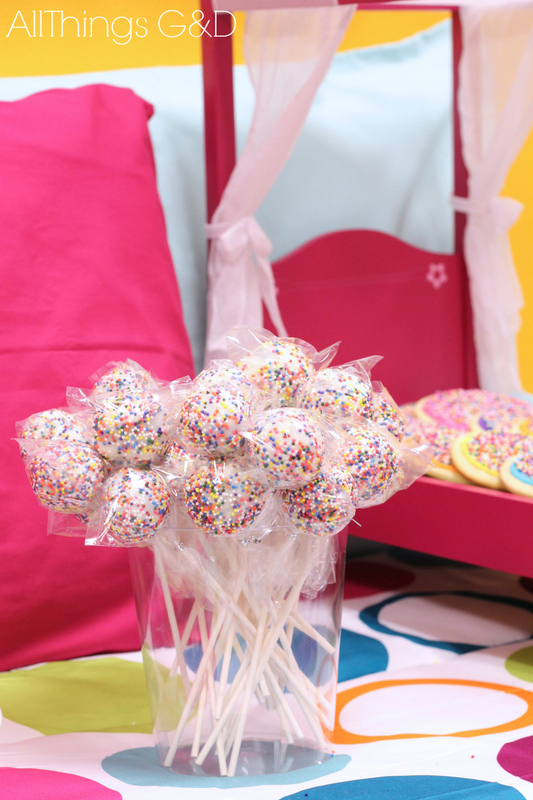 Polka dot sprinkled cake pops. With the room all set up, it was play time! 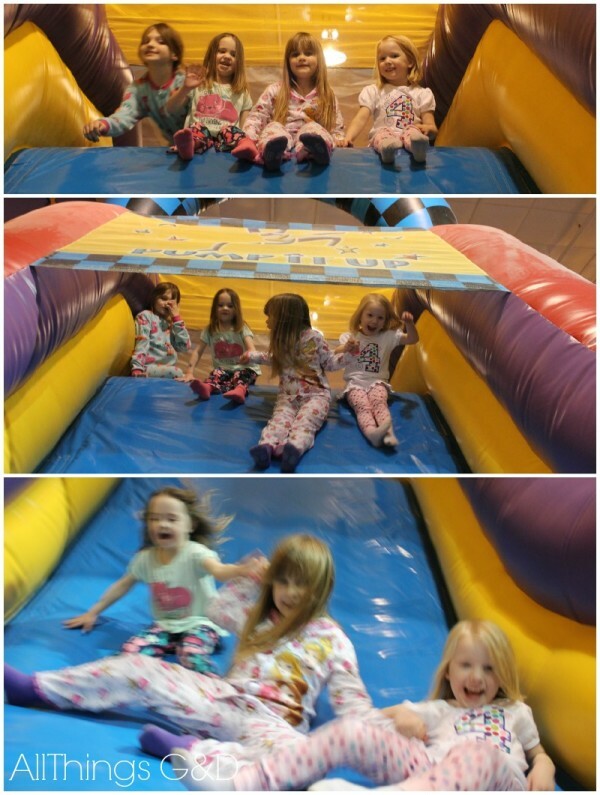 Kate & friends, going down one of the large inflatable slides! 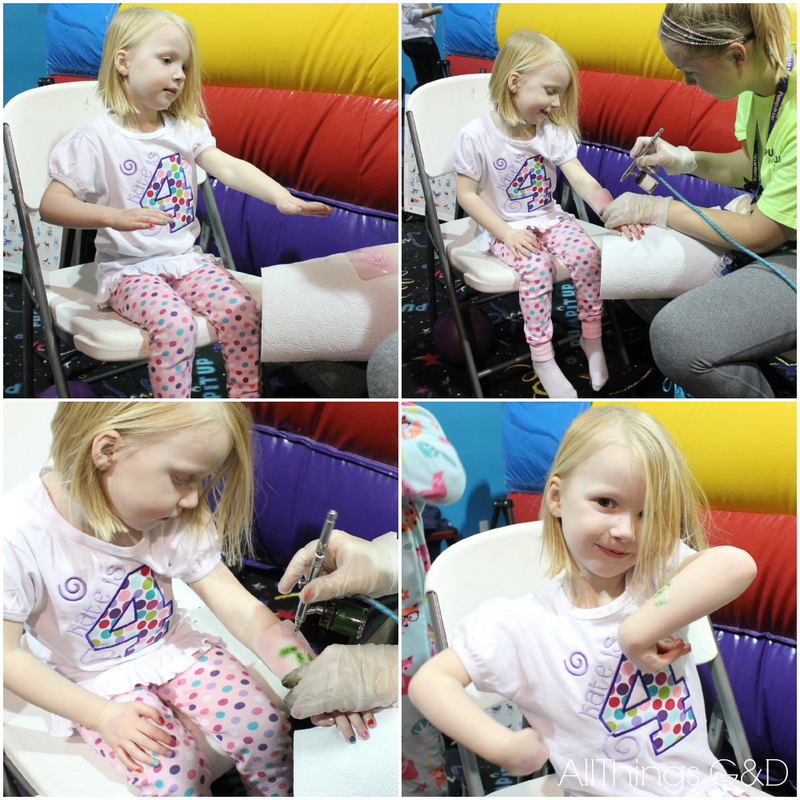 Kate, getting a caterpillar tattoo at her birthday party. And some of the adults did, too! Grandma Pam getting in on the tattoo fun! 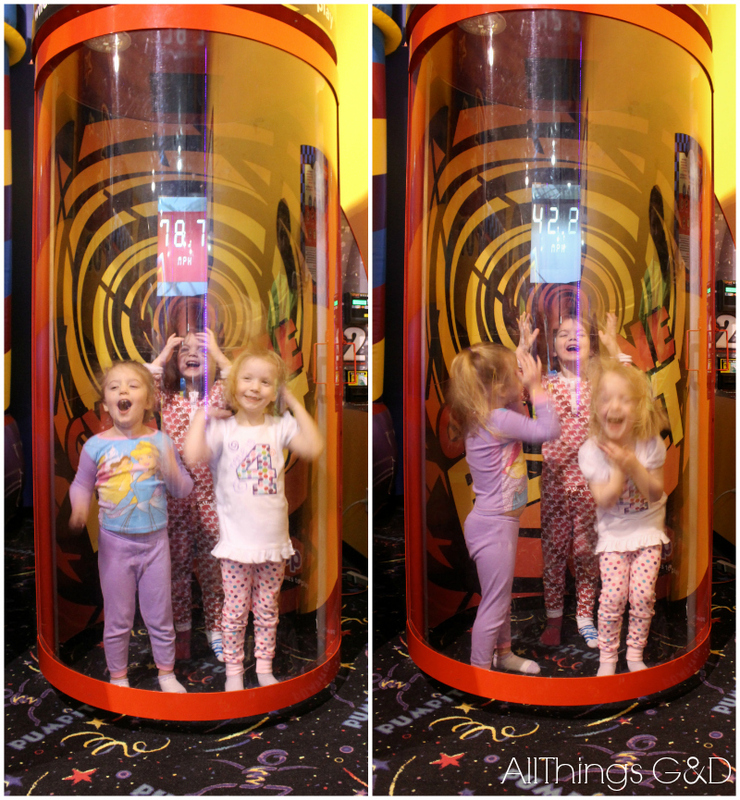 Lilly, Ruby, and Kate enjoying the wind tunnel in the first party room. 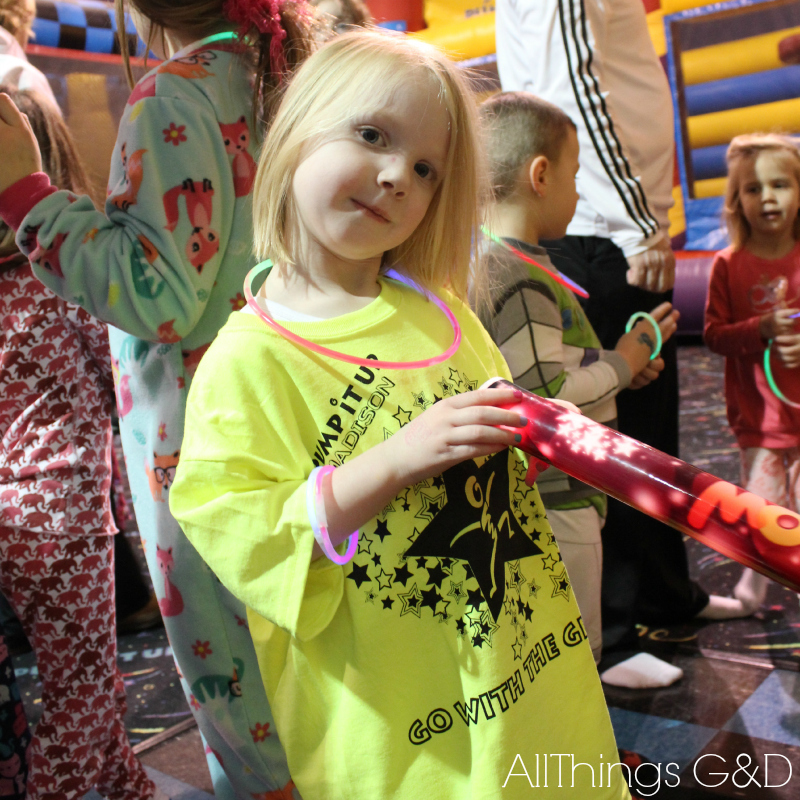 After about 45 minutes of playtime in the first room, the kids got decked out in glow bracelets (the birthday girl got a special glow wand and glow-in-the-dark shirt) before they headed into the second play room for a black light party (think preschool rave) filled with even more inflatable fun! All decked out to go next door to the glow-in-the-dark play room! Blowing out the candles on her polka dot cake. I made the inside of Kate’s cake with polka dots, too! Stealing the birthday girl for a couple of quick family pics! There’s nothing G and I enjoy more than celebrating this little 4 year old! 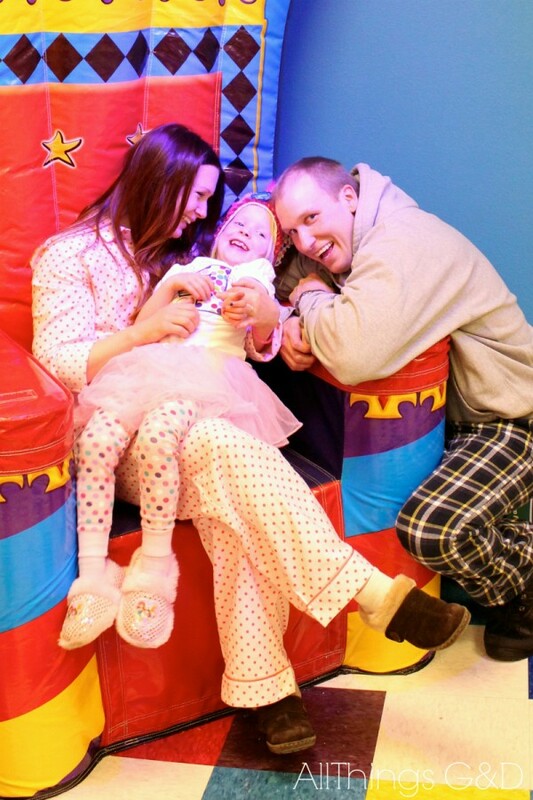 I’ll be doing a follow-up post on the “The Making of Kate’s Polka Dot Pajama Party” soon! In the meantime, please let me know if you have any questions about any of the decorations or party details! Like this post? 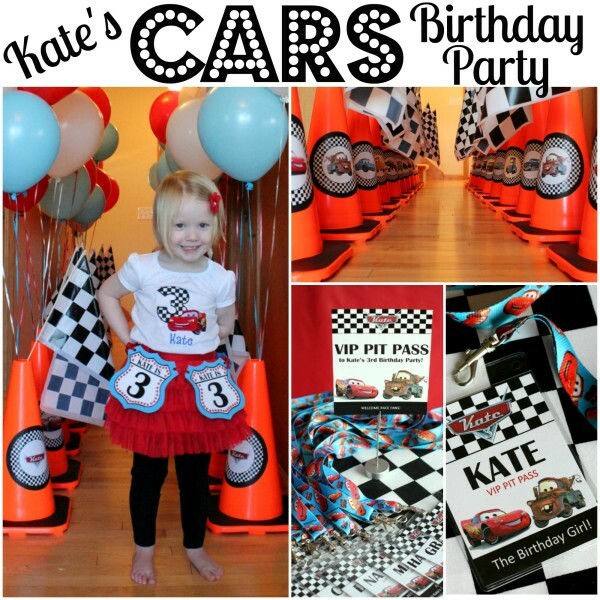 Check out Kate’s past birthday parties! LOVE the party! I’ve been waiting to see what you did for Kate’s 4th. Your parties are so awesome. Great job, Dusty! We have a similar party & play place here in Lexington (KY) that Anna loves, and I’ve imagined how I would decorate it for a birthday. You’ve given me some great ideas as as usual! I’m so happy to hear it, Carla! 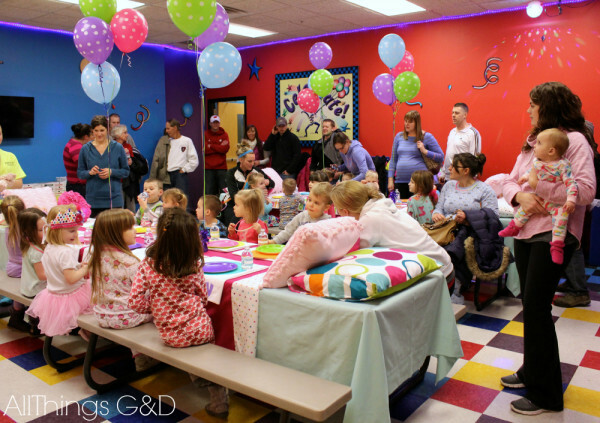 This was the first time we’ve had KPR’s birthday at a “party place” and whoa, it was nice! They really help you out and take some of the pressure off. I hope you have a similar experience for Anna’s next birthday party! What a cute way to make a fun party!!! I love it! 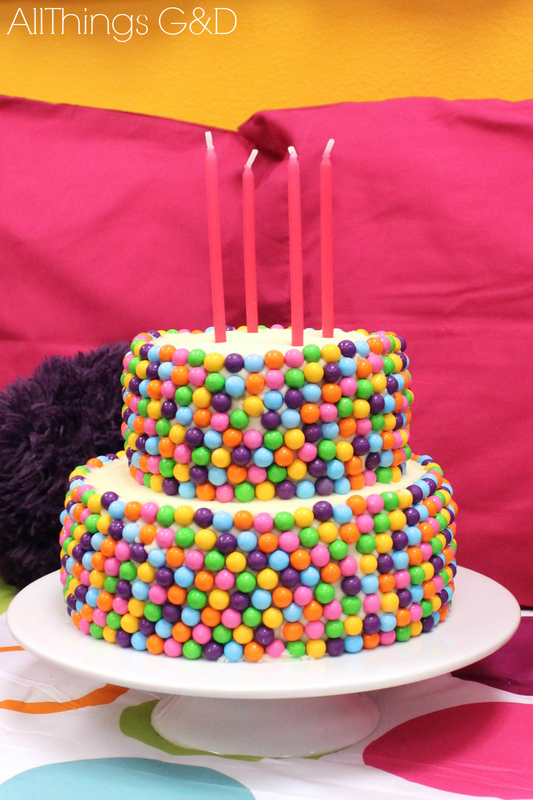 All the colors and THAT CAKE! OMG! 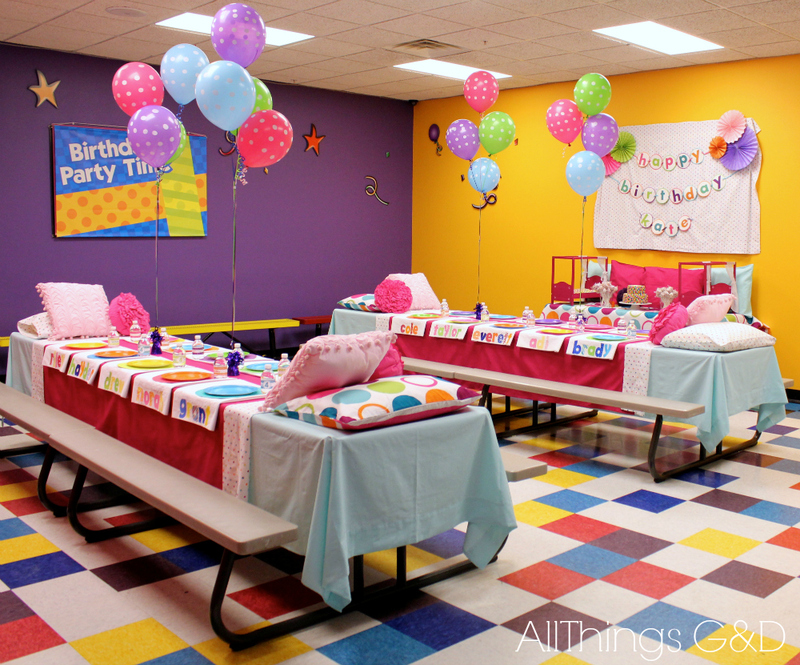 You throw the best birthday parties! 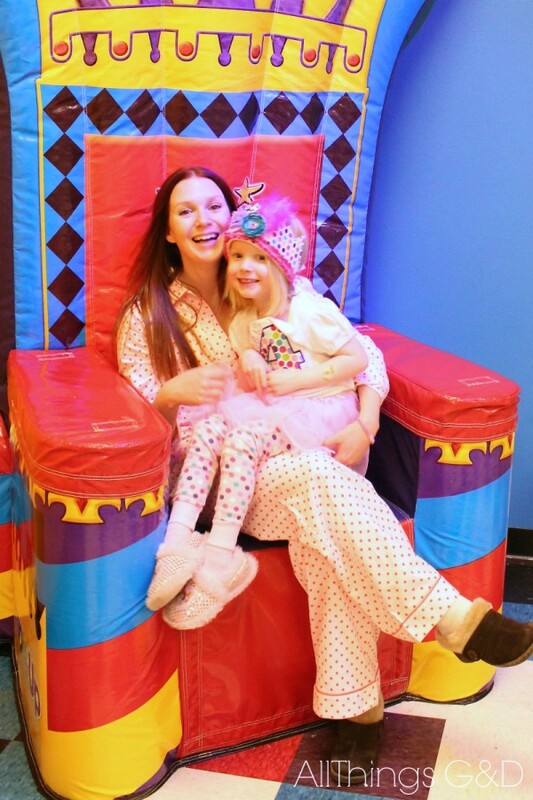 I loved the movie theater idea, but I think the pajama party takes the cake! 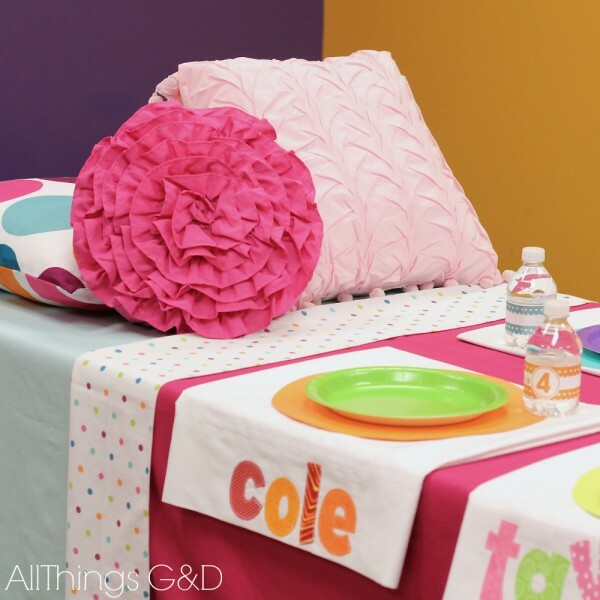 Monogrammed pillow cases as favors – genious! Thank you so much, Diana! Those suckers got me to sit down at a sewing machine for the first time in 20 years, and were time-consuming as heck, but I LOVED doing them and seeing how excited the kids were to receive them. Totally worth it! You are amazing. What you can accomplish, while still working full-time, somehow inspires me instead of making me hate you. Well played, D. Well played. Can’t wait to hear the details. I’m especially intrigued by the polka dot cake. LOL! Thank you for not hating me, Julie! Full disclosure: I was off of work for most of this week, and I smuggled in a glass of wine in my coffee thermos the night of the party – I’m not as pulled-together as you might think, hahaha! So freaking cute!!! I love everything you did! And now I definitely have to check out Pump It Up! once my daughter is old enough (she just turned 12 months). It looks really fun! Thank you so much, Kate! 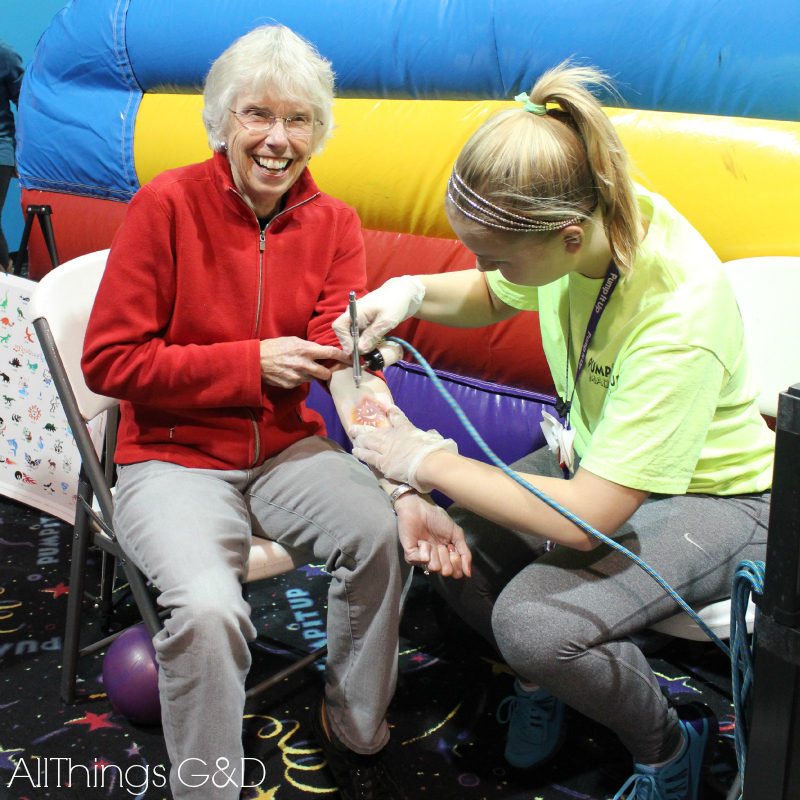 Pump It Up is one of our favorite places for drop-in play – especially in the winter! I hope your little girl loves it as much as Kate does! You are an amazing Mother…..You deserve Mother of the year in my book. You are so sweet, Debbie – thank you! 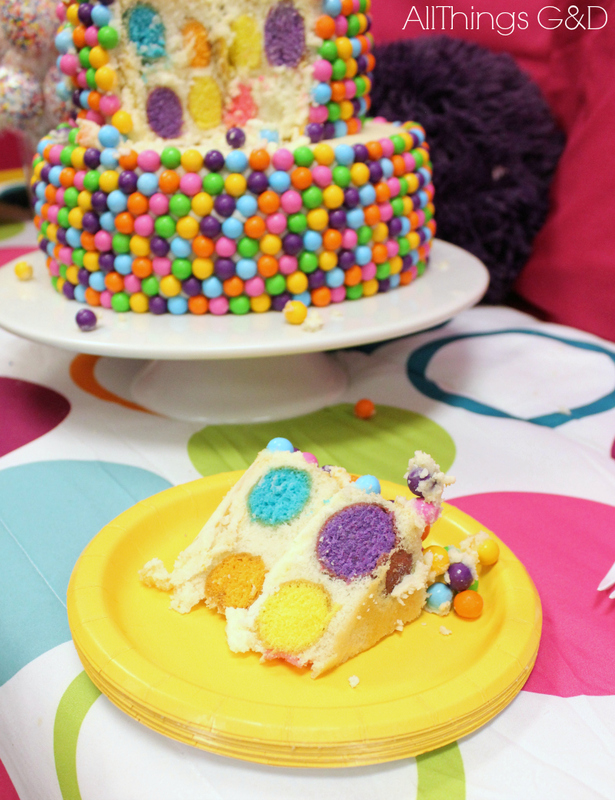 One slice of polka dot cake, coming right up. Girl, you have talent. Plain and simple. The creative ideas you come up with are just amazing. Stuff I’ve never seen before and never would have thought of. Pinning. Thank you so much, Kim! 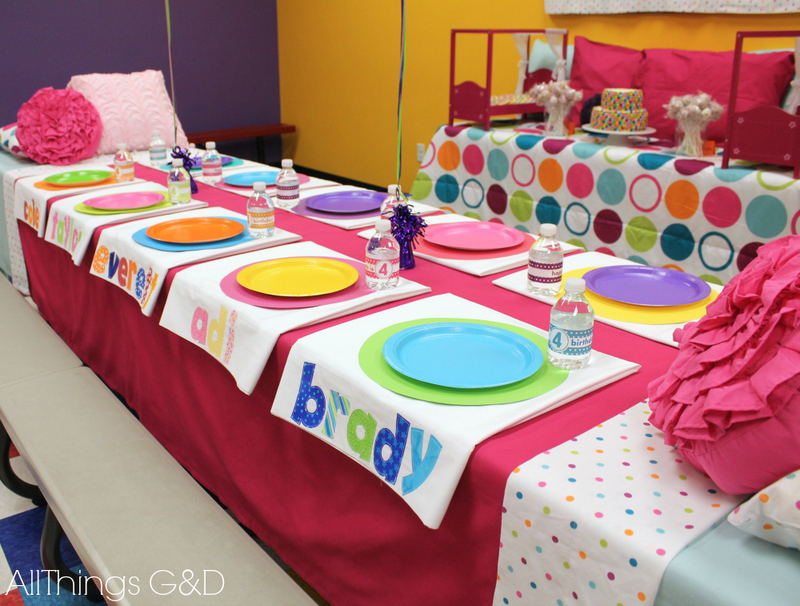 I still remember seeing pics from Henry’s 1st birthday party and LOVING all of YOUR amazing ideas!! Perfect timing, girl. Planning my daughter’s 3rd birthday right now with a pancakes/pajamas theme. 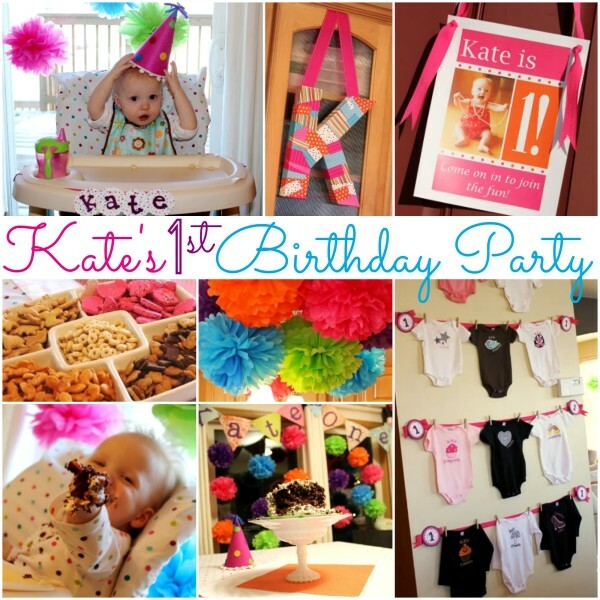 Dying to see the invitations you went with for Kate’s, if you wouldn’t mind sharing!! Love the polka dots. I think my Audrey will LOVE all of the VERY ORIGINAL ideas I come up with (steal from you). Thanks Stephanie! On the invitations front…gotta admit – I went with the good ol’ evite. Nothing fancy there, haha. And please, steal away! Most of my ideas were inspired by things I’ve seen online that I just put my own spin on, or flat-out copied (look for links coming in the “making of” post!). IMO we’re all just one big incestuous family of internet ideas and good intentions. I have been reading your blog for awhile and have never commented before. I am in LOVE with this theme. Cutest party ever! 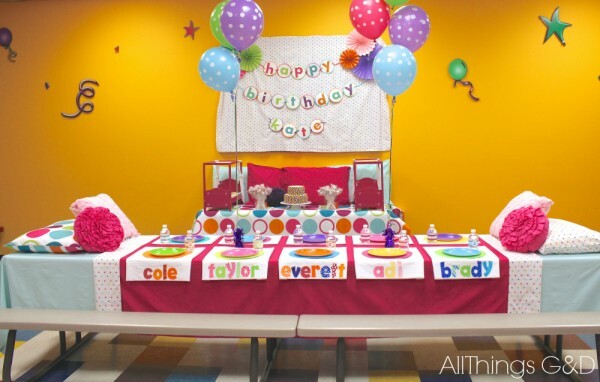 I just got done doing a blue and green alligator 1st birthday party using my son’s Pottery Barn Kids bedding as the inspiration and I had so much fun planning it (thanks to lots of northern Indiana snow days I was able to make all of my ideas come to life). You have the best ideas- so unique, I will be filing this one away, right after I make my homemade cleaning products! 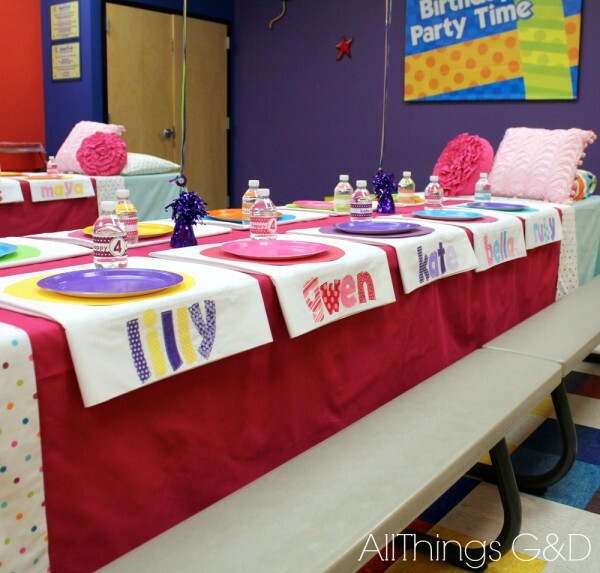 I am already picturing this party with a boy in mind! Thank you for sharing all of your fabulous ideas. I love seeing working moms still embrace their crafty and creative sides for the good of their families! It can be hard, but totally doable…I can’t wait for my little man to be old enough to get creative with me! Thank you so much, Angela! Your blue and green alligator 1st birthday party sounds spectacular! How creative!! Hi There, how did you make the polka dots inside the cake? Hi Amanda! I’ll be posting a “making of” post soon – stay tuned! 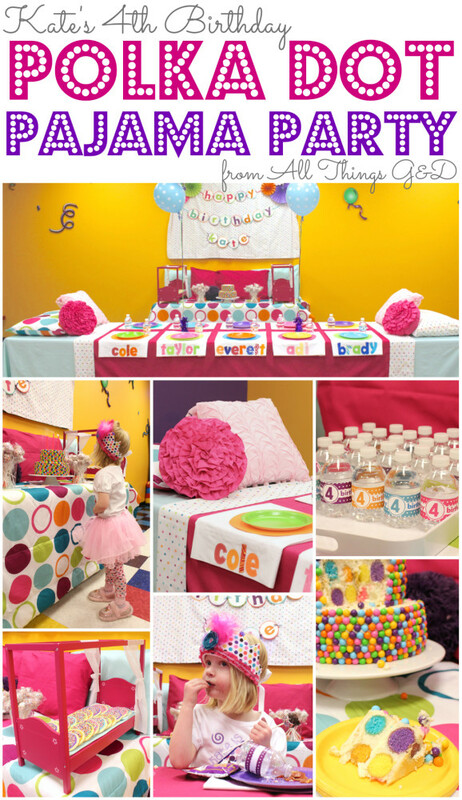 I love, love, love your birthday ideas so much! I have a 1 1/2 yr old & an almost 9 yr old, both girls! I find ways to use you ideas with my own twist and find that I can use them for both girls even though their ages are spread out and Kate is kind of right in the middle! I can’t wait to see your “making of” Kate’s 4th birthday! Just checking that I haven’t missed it! Thank you, Latoshia! Yep, I used flat sheets for the table coverings – both underneath and on top. Good luck with your little girl’s party! Your setup is so cute. How did you make the placemats under the plates? Thanks so much. Hi Willow! The polka dot placements under the plates are 12″ sheets of card stock that I cut into circles. Super easy!